Creating a rotating, high powered LED light that is durable, user friendly and FAA approved. Since the development of aviation, technology, in general, has helped sculpt commercial airline travel and the amenities they provide. In-flight movies and meals have been simple but genius implementations to the air travel experience. Recently, we now have the ability to surf the web while in flight thanks to an onboard WiFi hub. 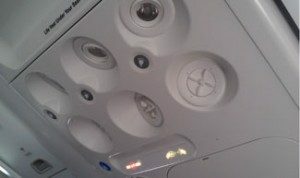 However, something as simple as low energy but powerful lighting designed for personal use was missing from the flying experience. 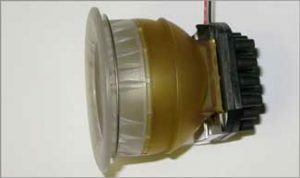 A leading Aircraft Manufacturer sought the help of Adept to develop an adjustable LED reading light that would adhere to strict aircraft specifications. There were many tests that were required to pass the standards of both the manufacturer and the FAA. The aviation light had to be able to remain cool after long duration of use, be fire retardant, withstand vibrations present in the Aircraft and present little to no electromagnetic interference. 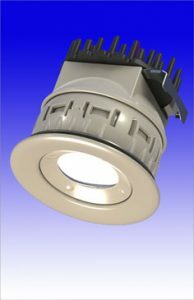 The manufacturer required the light be LED to meet the low power requirement along with little to no maintenance. Additionally, it needed to spherically rotate to illuminate all the angles passengers might want the light to point. Despite all of the regulations and requirements, Adept was able to design a distinctive LED aviation light that is in use by the Airlines today. 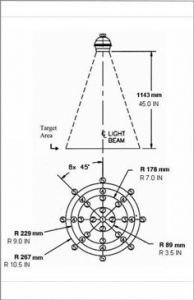 Designing this small light, a minute detail in a large passenger aircraft, required a definitive balance of mechanical, electrical and optical engineering. Knowledge in heat transfer, plastic injection molding, mass production manufacture, optical and FEA simulations, to name just a few. The models in CAD were rapid prototyped and sent to Adept for the electrical and mechanical testing. Besides design LED Aviation lights. Adept has designed LED lights for the marine, aviation, military and explosive environments.